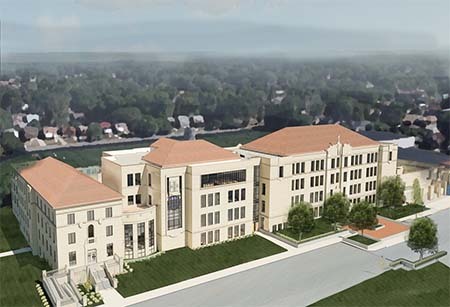 The University of Detroit Jesuit High School and Academy today announced that construction will begin on a $16 million STEM center, doubling the school’s space for biology, chemistry, and physics programs. The center is expected to be completed for the start of the 2016 school year. “Equipping our young men to be tomorrow’s leaders and innovators begins right here, right now in Detroit, where we continue the 450-year-old Jesuit tradition of academic rigor and critical thinking,” says Karl J. Kiser, president of University of Detroit Jesuit High School. The four-level, 40,000 square foot center will include labs for engineering and research, along with space for the school’s eco-car and robotics programs. There also will be a classroom and laboratory for seventh and eighth grade students (from the University of Detroit Jesuit Academy). Alumni in attendance at today’s groundbreaking event included Dr. Otis Brawley, chief medical officer for the American Cancer Society; Guy Consolmagno, a Vatican astronomer; and Stephen Henderson, editorial page editor of the Detroit Free Press.